Anybody who likes to stay informed about national issues knows that gun control, or the lack thereof, is a hot topic right now. School shootings are at an all-time high, and national news is constantly littered with new, senseless crimes committed by somebody with a gun. There are many questions we must ask ourselves when considering this issue. For example, we have seen that many perpetrators suffer from mental illness, which has brought up the idea that mentally ill people should not be approved to carry a weapon. Well, how mentally ill is too mentally ill? Does having anxiety mean you can’t buy a gun? And what about the legal carrying age? It seems many shooters are relatively young. Should it be raised? Another question I’ve considered centers around “gun-free zones” such as college campuses and schools. Do these policies really protect us, or do they perpetuate the problem? This article is not meant to point you in one direction or the other. My purpose in writing it is to get you thinking about these questions that are often too taboo to talk about. Let’s talk about mental illness first. Pretend you have a stalker and you don’t feel safe in your own home. You go to the gun shop to purchase a small handgun, and you are denied because you were hospitalized for a panic disorder last year. Is this just? We all like to think that only those with “severe” mental illness will be prevented from purchasing guns if this reform happens, but laws are rarely general enough to umbrella mental illness as a whole category. We will need specifics. What is “severe” mental illness? Does this apply only to people on medication? And who decides which mental illnesses count? Do clinical psychiatrists have a say? As you can see, there’s no simple solution here, even though we like to pretend there is. Another question I want to touch upon is the legal age to carry. Every state varies a little, but the general age in this country is 18-21 to purchase and carry a concealed weapon. On May 21, 1998 a 15-year-old student shot and killed his parents and drove to his high school, where he shot 25 people and killed two more. In the infamous 1999 Columbine massacre, the two perpetrators were high school seniors, 17 and 18 years old. In 2012, the Sandy Hook elementary school shooter was 20 years old. There are countless more stories like these, where young people, under the legal age, committed violent crimes because somebody, somewhere, allowed them access to a gun. And it’s not just about the legal age to purchase. Last week, an 11-year-old boy shot and killed an 8-year-old girl over an argument about puppies. One opinion I will state loudly and proudly is that children should not have access to guns! The final topic I want to discuss is the concept that “gun-free zones” are perpetuating our problem. Think about it: Lesley University is a gun-free campus. No tolerance, no exceptions. So anybody who knows this policy could plan and execute a mass shooting, while being almost certain nobody else would have a weapon. They would have the upper hand. Are we actually protecting ourselves from danger, or are we putting ourselves further in harm’s way? It’s something we must consider. I personally feel safer knowing there are no weapons in my dorm. However, if somebody else were to come in and start shooting, you can bet I would want somebody to stop them. And if they need a gun to do that, then so be it. Evidently, it’s not a black-or-white decision to make. There are pros and cons to each. At the end of the day, though, we need to determine which instance makes us safer. To reiterate, there are not necessarily right or wrong answers to these questions, nor are there simple solutions to the problem of gun violence. But the real problem is we live in a country where we don’t like to talk about it; in fact, too many people have their mind made up and won’t have a discussion. So, while the topic of guns may be controversial, I hope this article has given you food for thought. Perhaps next time you turn on the news and there is a school shooting or some other vicious crime committed with an unregulated weapon, you will think about what steps can be taken to prevent it from happening again. And it starts with being willing to have difficult conversations. 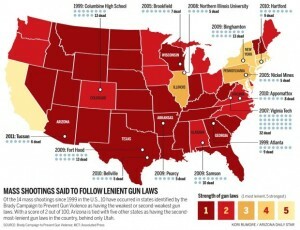 According to the Brady Campaign to end gun violence, states with lenient gun laws have more mass shootings.